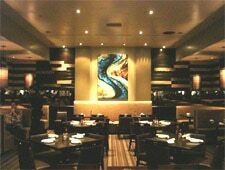 A traditional seafood restaurant in The District at Tustin Legacy is a good thing for central OC foodies. : This contemporary space at The District at Tustin Legacy does not have the pronounced nautical theme of its sibling location in Newport Beach. Rather, a cosmopolitan sophistication reigns here, with soaring wood ceilings, handsome leather booths, a marble-topped bar and a patio with a roaring fireplace. The daily changing menu focuses on the freshest seasonal seafood from around the world, which typically includes several oyster varieties, clams, tuna, hamachi, lobster, calamari, salmon, scallops, trout, halibut, mahi mahi and barramundi. In addition to grilled fish, the menu has more modern, innovative dishes, such as blackened swordfish with pineapple salsa and green rice; a Mediterranean-style ahi salad; and mussels with Spanish chorizo. And while Bluewater Grill is known for its creamy New England clam chowder and other classics, don't overlook specialties such as a whole Maine lobster baked with a shrimp stuffing. Those who prefer to enjoy something other than seafood will find a small menu of steaks, chops and burgers. The wine list is rather extensive, with a good selection from mostly California producers.